RISK. The buzzword of the modern times. The talk around this word is so ubiquitous, it is almost mind-boggling. Yet, I somehow always thought the concept of risk is rather overhyped and exaggerated, as far as the way it gets spoken and feared about in our daily lives. I pass through this very intersection every morning with so much ease. Today, the pace is skewed. There is a sense of disarray as motorists try to push past each other through the traffic light. The light here always tests their agility because if you miss the green, you have to wait for another three minutes before it lets you go past again. Those three minutes become eternity for an otherwise time-insensitive nation on the move. Today, there is a sense of chaos here. People are honking, skirting each other and rushing past. I look out of my window to seek the reason. It is not difficult to find because it is lying strewn all over the place. A tomato seller’s cart has overturned. There are tomatoes everywhere and the rushing motorists are making pulp of it. The man is trying to get his cart back on its four rickety wheels and a few passersby are picking up what they can in an attempt to save him total loss. Though symbolic in the larger scheme of things, it is not a substantive gesture. His business for the day is over. The way this man’s economics works is very simple. There is a money lender who lends him money for just one day, at an interest rate of Rs 10 per day per Rs 100 lent. With the money, he wakes up at 4 am to go to the wholesale market for vegetables. He returns, pushing his cart a good five miles, and by 7 am when the locality wakes up, he is ready to sell his day’s merchandise. By the end of the morning, some of it remains unsold. This his wife sells by the afternoon and takes home the remainder, which becomes part of his meal. With the day’s proceeds, he returns the interest to the money lender and goes back to the routine the next day. If he does not sell for a day, his chain breaks. Where does he go from here? He goes back to the money lender, raises capital at an even more penal interest and gets back on his feet. This is not the only time that destiny has upset his tomato cart. This happens to him at least six times every year. Once he returned with a loaded cart of ripe tomatoes and it rained heavily for the next three days. No one came to the market and his stock rotted in front of his own eyes. Another time, instead of the weather, it was a political rally that snowballed into a confrontation between two rival groups and the locality closed down. And he is not alone in this game of extraneous factors that seize not only his business but also his life. He sees this happen to the “gol-gappa” seller, the peanut seller and the “vada pao” seller all the time. When their product does not sell, it just turns soggy. Sometimes they eat some of it. But how much of that stuff can you eat by yourself? So, they just give away some and there is always that one time when they have to simply throw it away. Away from the street-vendor selling perishable commodity with little or no life support system, the corporate world is an altogether different place. Here we have some of the most educated people in the country. We don the best garbs. We do not have to push carts; our carts push us. We have our salary, perquisites, bonuses, stock options, gratuities, pensions and our medical insurance and the group accident benefit schemes. Yet, all the while, we worry about our risks and think about our professional insecurity. We wonder, what would happen if the company shifted offices to another city? What would happen if the department closed down? What would happen if you were to take maternity leave and the temporary substitute delivered better work than you did? What would happen if the product line you are dealing with simply failed? In any of those eventualities, the worst that could happen would still be a lot less than having to see your cartful of tomatoes getting pulped under the screeching wheels of absolute strangers who have nothing personal against you. 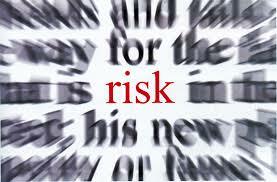 All too often we exaggerate our risks. We keep justifying our professional concerns till they trap us in their vicious downward spiral. Devoid of education, sophisticated reasoning and any financial safety net, the man with the cart is often able to deal with life much better than many of us. Is it time to look out of the window, into the eyes of that man to ask him, where does he get it from? In his simple stoicism, is probably, our lost resilience. Thought-provoking, isn’t it? What do you think? 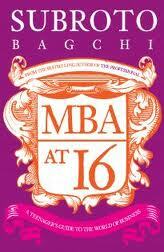 Just completed reading the latest book from Subroto Bagchi, ‘MBA at 16; A Teenager’s Guide To The World Of Business’, Penguin 2012. This is an absolutely path-breaking work! The Gardener pens a very crisp, captivating and insightful piece for the 16-year olds, taking them through the world of business. Like all his earlier works, in this book too, he doesn’t preach, doesn’t load you with information. Contrarily, he ventures into the real world of 31 students, all in their teens; spends months with them, becomes a part of them, and finally comes out with this very simply-written, yet a well-researched work. All of 157 pages, you would assume that it’s a 3-hour read at best. It could have been, yes. However, once you start reading, you’d not simply pass through the pages. Despite the fact that the book is written in form of a simple story, every page offers learning to 16 years and 32 years old alike! He takes us in the life of a teenager and helps us view business from their eyes. Much contrary to the prevalent opinion that teenagers are only hooked on to MTV, X-Box, dating and masti, the book captures the promise this GenY-minus-10years would bring in the world of business. As a 32 year old, I found this book equally useful for me. It made me ponder, introspect; am I equipped with skills and attitude required to manage this generation? Or, to be managed by this generation, one day not very far? I found a lot of questions to answer, many a things to learn. 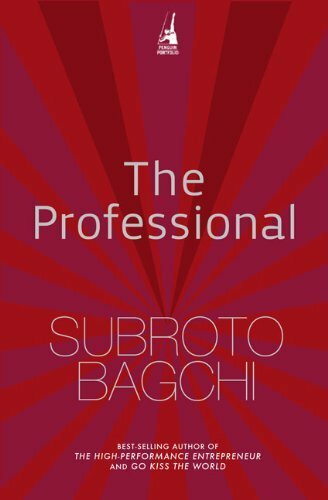 I am sure that at the end of the book, you’d also like to thank Subroto, for his appreciation and efforts in the direction of creating a smarter corporate India. I believe all of us share the responsibility.